The 2011 Commonwealth Reading Series of events with MCC writers and poets begins this week with a reading at Porter Square Books in Cambridge (Tuesday, March 15, 7 PM). That’s just the beginning. The series continues this Friday, March 18, 7 PM at Grub Street, Inc. – Boston’s hub of literary community and just general coolness. One of the writers reading at Grub is the superb Jamie Cat Callan (Fiction/Creative Nonfiction Fellow ’10). We had the chance to ask Jamie about her writing, books, and unmistakable joie de vivre. ArtSake: Your writing experience is so varied – young adult novels, short stories, screenplays, relationship advice, writing tips, memoir. When you conceive a new work, is the form (novel, script, nonfiction work, etc.) immediately apparent, or do you sometimes have to explore different forms to find the right fit? Jamie: And you didn’t mention poetry and plays! Still, I suppose the form is very much determined by the influences in my life and who is around me. For example, I wrote short stories and plays during a time when I belonged to The Writers Bloc, a group in Los Angeles made up of writers and actors. Then, I wrote screenplays while I was getting my MFA from UCLA film school. After film school, I began teaching at Wesleyan University, Educational Center for the Arts, NYU, Yale and then at Grub Street, and so I created The Writers Toolbox, out of the games and exercises I used in my classes. Most recently, I’ve reconnected with my French roots and discovered more history relating to my French grandmother. I loved how she had this spicy marriage with my grandfather. They didn’t always agree, but they certainly adored each other. This is how I became inspired to write French Women Don’t Sleep Alone. I think I wanted it to be an advice book because I wish my grandmother could sit down and tell me her secrets to romance, love, marriage and elegance. Oh, and how to make a great coq au vin! 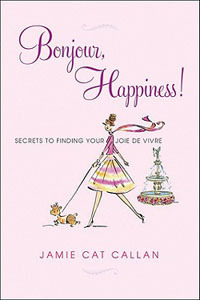 My latest book, Bonjour, Happiness! is an interesting mix of memoir and advice. I actually wrote a proposal for a memoir about my travels to France (beginning in the 1970’s and up to the present) and my editor said she wanted the book to be “prescriptive” but that it could be still be “narrative.” And with that, I think I’ve created a hybrid genre – the literary advice book! Anyway, perhaps this is another answer to your question about what determines the form my writing takes – it’s unpredictable and it’s just how the stars happen to align. ArtSake: You mentioned Bonjour, Happiness! Secrets to Finding Your Joie de Vivre, which is just about to be published. But you won your MCC award by submitting a work of fiction. Writing is rarely ever easy, but does either form, fiction or nonfiction, come more naturally to you? Jamie: For me, fiction is delicious and dreamy. I enter into an imagined world and just let it lead me into surprising, sometimes illogical places. Along the way, characters introduce themselves to me, take me by the hand and together we get into trouble. Lots of trouble (narratively speaking, of course). For the story that won the MCC grant, I was inspired by my husband who told me that when he was growing up in Madison, Connecticut during the 1960’s, the town was mostly a summer community and that because only a handful of people stayed over the winter they formed a “Winter Club.” This is where the title “Welcome to the Winter Club” comes from. I envisioned the club as a metaphor for loss of innocence and adulthood. From here, I imagined what it would be like for an adolescent boy experiencing his first sexual awakening in this community in the 1960’s during the Camelot years, when Kennedy was in the White House and Vietnam was a shadow in the not-so-far distant future. In terms of craft, when I am writing fiction, I write fast and let the characters lead me. At the end of the day, I put the work away. The next morning, I look at the writing with fresh eyes and see where I may have gone off course, or if I let one of the characters take over the story or lead me astray, and so I trim and edit and bring the story back into alignment. Now, you might be surprised to learn that when I am writing nonfiction, this process is rather similar, because I am still writing stories. The difference is, these stories are framed by a more obvious lesson or suggestion in terms of creating a happier life, as with Bonjour, Happiness! Even with this book, each chapter offers it’s own mystery to me and while my characters are real French (and sometimes American) women that I’ve actually met and interviewed, there are the same challenges as with fiction, in that I let a kind of narrative grow out of the basic idea of a chapter topic (for example, why lingerie is very important to a French woman’s confidence!) but then in the clear light of day I may find that perhaps I need to edit and trim that part about the history of lace corsets. Wink. Wink. ArtSake: How did Bonjour, Happiness! come to be? Jamie: In 2009, the Virginia Center for the Creative Arts awarded me a fellowship to spend a month writing in Auvillar, France. The village of Auvillar is a magical place in the southwest filled with fig and olive trees, roosters, and a town known for welcoming artists from all over the world. One day after I first arrived, I walked into the village around noon, only to find everything was closed. I was able to visit the ancient stone cathedral (built in the 11th century), but the boulangerie, the library, the shops and most of the restaurants were all closed. The streets were silent as if everyone in town had disappeared. But then, I peaked through the cobblestone courtyards and behind the lace curtains to find couples and families enjoying their mid-day meals. This is when the thought came to me – this is the secret to the French joie de vivre. Unlike our American “pursuit of happiness” the French find happiness in simple, pleasurable moments. In America, we often think that bigger and faster is better. For the French, smaller and slower is better. Happiness is an experience, not a thing you buy or own. And I felt so happy in that moment, relaxing in the sunshine of Southern France, knowing that the boulangerie would reopen at 2 p.m. and I would be patient, imagining that the baguette would be worth the wait and even more pleasurable because of it. ArtSake: You teach extensively, including at Grub Street writers’ service organization in Boston, and you wrote The Writers Toolbox. As a teacher, what do you try to instill in emerging writers? Jamie: Actually, The Writers Toolbox is not so much a book that I wrote, but a box of tactile writing games I created – you know, sticks and spiny dials and a little three minute egg timer, cards and then an instruction book. It’s all based on right brain theory – writing from that intuitive, nonlinear place. And this brings me to what I try to teach emerging writers: Follow your muse. Don’t worry about where you’re going or where you’ll end up. Write from the heart and believe that there is a place in this world for your voice, your story, your style. No one else can be you. You are completely unique and amazing in your own way. And as long as you stay true to yourself, your contribution to the world will be completely true and unique. Oh, and one other thing. Be kind to your writing. It lives and breathes outside of you. It’s a gift to you from your muse, so if you are kind to your own creations, your muse will make a habit of visiting you often. I don’t believe in tough love when it comes to teaching writing. I believe in love. Kindness. Gentleness. And of course a whole lot of joie de vivre. This is why I adore Grub Street and the Grub Street teaching philosophy. There’s a whole lot of love going on and I can’t imagine a place where writers receive so much support. We’re lucky to have them! Jamie: A long time ago, I decided to let go of the debilitating idea of becoming an overnight sensation. I let go of the notion of the acclaimed debut novel. I no longer care about being the next new thing. Rather, I’ve embraced the idea that I can be that gal who has been quietly and consistently writing all along (since 1973) while raising a daughter, making a living, moving around, experiencing all the unexpected ups and downs of living a full life. The overnight sensation ship sailed long ago, but I am here and this is my journey. All this is to say, no one decision had the most impact on my career, but the decision to move forward, have faith and just write no matter what, has made all the difference in the world. ArtSake: What are you reading these days? What are you writing? Jamie: I am reading Malcolm Gladwell’s What the Dog Saw. I love his writing! I am writing the book proposal for my next book, Bonjour, Beautiful – Secrets to Finding your Ooh la la! And I’m also working on turning “Welcome to the Winter Club” into a novel. If anyone wants to give me a nice advance, please speak up and don’t be shy! Jamie joins Cheryl Clark, Adam Schwartz, Ron Spalletta, and Marc Velasquez for a Commonwealth Reading Series event on Friday, March 18, 7 PM, Grub Street, Inc. in Boston. Other events include Porter Square Books (3/15 and 3/31), Forbes Library in Northampton (3/23), and Newtonville Books in Newton (4/5). 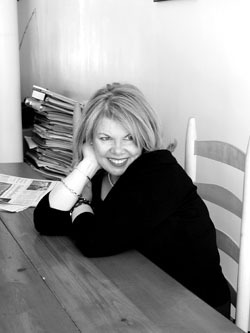 Jamie Cat Callan is the creator of The Writers Toolbox (Chronicle Books, 2007) and the author of French Women Don’t Sleep Alone (Citadel/Kensington, 2009). Most recently, she received a grant from the Virginia Center for the Creative Arts in Auvillar, France where she wrote her latest book, Bonjour, Happiness! (Kensington/Citadel, 2011) Jamie is married to a Woods Hole Oceanographic climate change scientist. The story of how they met (he was a student in her creative writing class) and eventually married – appeared in the New York Times Modern Love column. Images: Jamie Cat Callan; cover art for BONJOUR, HAPPINESS! by Jamie Cat Callan (Citadel Press, 2011).